Mountain Prenj is the most beautiful and most impressive mountain in Bosnia and Herzegovina. It is certainly one of the most beautiful mountain massif of the Dinaric Alps. Prenj is not only a mountain, Prenj is the Kingdom, the Kingdom of an incredible divine mountain beauty! The mountain has been many times described as the "Bosnian Himalaya". Himalayan veterans should treat this comparison with caution. Nevertheless to Bosnian mountaineers Prenj is definitely the most special place; rich in mountaineering history, endemic species, and provides the largest variety of mountaineering challenges in this region. Check tours or arrange special tour. Čvrsnica is a mountain in the Dinarides of Bosnia and Herzegovina, located in northern Herzegovina. The mountain consists of several plateaus — Plasa and Muharnica on north, Mala Čvrsnica on south. 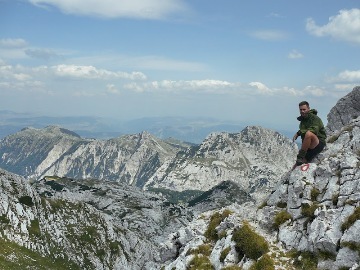 There are more than ten summits above 2000 m, vertical cliffs (Pesti brdo, Mezica stijene, Strmenica ...). It also includes lakes of Blidinje, Crepulja and Crvenjak. The Diva Grabovica canyon (6.2 km) goes into the mountain. Bio-life is characteristic of its three climate areas: conifers above 1200 m, plateau with grass and junipers; numerous endemic species (like Munika Pine). Cvrsnica is well known as a home of chamois. Geronimo template created by GeronimoHosting by Mreža d.o.o.Hosted by Mreža d.o.o.